Getting equipped for waterfall ice climbing, a highly equipment-intensive activity, used to be easy. You just had to buy some screws, technical ice tools, crampons, and wander around the mountains until you found a frozen cascade. Fortunately, recent advances in technology now enable us to climb and protect ice much more efficiently than in years past, but these advances have also made buying ice equipment much more complex. 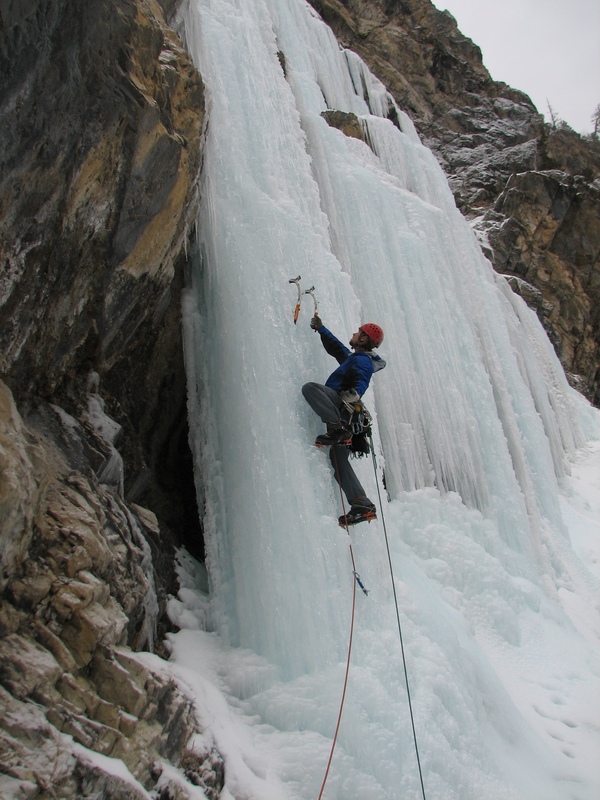 Here I’ll delve into some considerations for selecting equipment for waterfall ice and mixed climbing. The base component of an ice climbing rack is the tubular ice screw. Modern screws feature high relief threads that greatly increase the holding power over older, pound-in, and fine-threaded designs. Look for a model that is tapered from the teeth to the hanger since they fracture less than non-tapered models. Models that are coated in stainless steel like the Black Diamond Turbo Express rust much less, giving you piece of mind (even though the typical amount of rust is merely a cosmetic annoyance, not a structural hazard). Hangers that facilitate rapid placement with features like “turbo knobs” or wire handles are worth the extra cost because they are so much faster and easier to place. It is often possible to protect ice climbs with supplemental rock protection if you are climbing an ice route directly adjoining rock. In addition to being fast to place, rock gear can inspire confidence when attacking hard sections of ice climbing. Rock protection is also critical when climbing “mixed” routes, or routes that necessitate both rock and ice climbing in varying amounts. Depending on the ratio of ice to rock on the route, I adjust my rack accordingly. More ice means more screws; more rock means fewer screws and more rock gear. The rock type dictates the exact composition of the rack. For limestone routes with lots of parallel cracks, I emphasize cams and pitons over stoppers since stoppers don’t tend to place well in that type of rock. For routes on granite, conglomerates, or chossy/broken rock, I reintroduce the stoppers to the mix. Pitons are universally good. Ice pitons don’t work well in ice, but are invaluable for driving into dirty cracks and frozen moss. Placing a stopper on an ice climb in Leavenworth, Washington. Designed to reduce the peak impact force on a piece of protection, load-limiting slings, such as the Yates Screamer or Petzl Nitro, deserve a place on your rack. These quickdraw-like slings are designed to elongate when a high force is placed on them, thus lengthening the duration of the fall and resulting in less force being transmitted to the piece of protection holding the fall. I always place these on the first piece of protection off the belay and also on dubious pieces thereafter. For the remaining slings, I find that models composed of Spectra/Dyneema work better since they are lighter, more packable, and don’t absorb water. Carabiners are a great place to save weight on your rack. All non-locking carabiners should be wiregate models that are large enough to manipulate with gloves on. These are much lighter and are also much less susceptible to freezing shut and suffering from gate flutter. Avoid using those tiny sport climbing carabiners since they are impossible to be efficient with while wearing gloves. Locking carabiners should be large enough to use a munter hitch on in case your rope freezes or you drop your belay device. 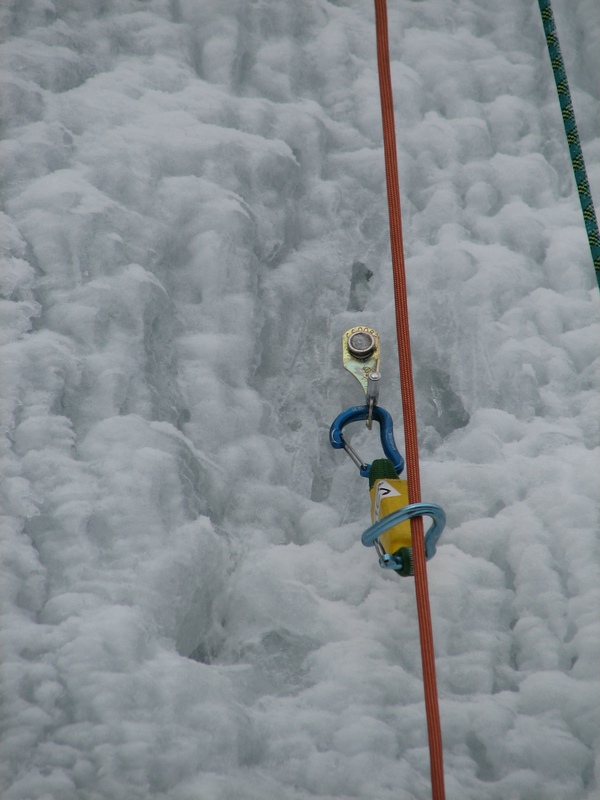 Using a load-limiting sling to reduce force on a screw placed in aerated ice. Because ice protection is less bomber than rock protection, falling on ice is always a bad idea, and anything you can do to reduce impacts on protection is in your best interest. Rope systems can effect those impacts. 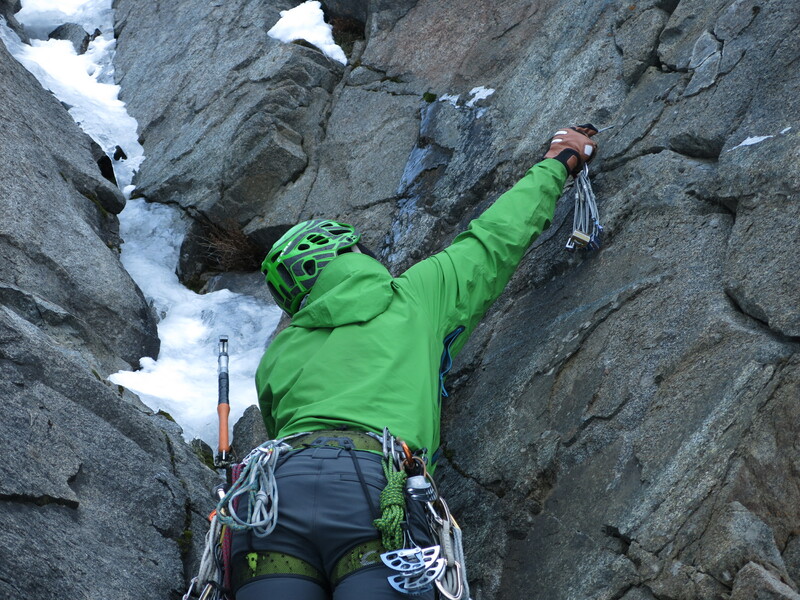 Rope systems for ice and mixed climbing have the same variability as protection. The simplest system is a single rope, usually 60 meters long and with a 9 to 10mm diameter. With a single rope, rope management is greatly simplified as it mimics the typical rock climbing setup, but it halves the length of any rappels you have to make. When used properly, half ropes (sometimes called “double ropes”) with a diameter of 8.0 to 9.0 mm allow full-length rappels and can decrease the amount of rope drag (because you clip each rope into alternating protection) as well as impact force (because of greater stretch). Twin ropes, another type of rope system, are clipped into each piece of protection just like a single rope, but they offer full length rappels and increased redundancy (since there are two ropes in case one is cut over an edge, hit by an errant tool placement or crampon, or chopped by ice or rockfall). It should be noted that twin ropes result in more impact on protection pieces than either of the other two ropes systems. In rock climbing where protection for the most part is very sound, this isn’t as much of a concern as in ice climbing where impact force can be a very bad thing. My preferred option is a single rope combined with a tag line. Generally speaking, the tag line, which is a 7mm nylon cord, serves as a pull cord for your single rope, thus allowing full-length rappels with less weight than a double rope system. No matter what rope system you choose, get dry treated ropes. They last longer (because the sheath is more resistant to wear), and they absorb less water than non-treated ropes. A full length shank – This stiffens the boot sole to provide a solid platform while climbing. Welts – think of these as “benches” for your crampons to sit on. “Fruit boots” are lower profile boots that feature integrated, bolted-on crampons. These excel on difficult mixed climbing in a crag setting, but due to their design aren’t very warm and aren’t comfortable to walk in. If you plan on using these, bring a different pair of boots for the approach and for belaying. The most important feature of crampons for ice climbing is their ability to fit onto your boots securely. Choosing between horizontal or vertical frontpoints can be challenging. For pure ice climbs, horizontal frontpoints offer more surface area and stability, especially in porous or aerated ice. Vertical frontpoints offer greater precision for technical ice and really shine on difficult, mixed climbs. An added bonus of vertical frontpoints is that replacement frontpoints are available, meaning that after a sharpening them over and over, you only have to replace the frontpoint and not the entire crampon. All modern ice tools climb well. The debate rages on about leashed versus leashless models and each has its merits. Each type of tool has different characteristics (swing, weight, balance, etc), so it is ideal to climb on a variety of models and select the one that fits your swing style best. On pure ice and alpine pitches, I prefer to climb with a hammer on one tool and an adze on the other. Adzes are indispensable for clearing away large amounts of poor ice, chopping bivy ledges, or camming into cracks. Hammers are crucial for placing and removing pitons. The consequences of your tool popping out and the adze smashing into your face is more severe than a hammer, so beginners may find that using two hammers may be safer (i.e. you’ll get a bruise instead of stitches); I also prefer using two hammers on bolted mixed routes. Tethers have become increasingly popular in the past few years. These are invaluable for alpine climbs and on most multi-pitch climbs where a dropped tool might ruin your day. For single pitch climbs, tethers merely clutter your system and are much less useful. Remember that these are designed to prevent a dropped tool, not catch you if you fall! Always wear a helmet when climbing ice. Period. I’ve seen too many people who would have gotten seriously hurt or killed if they hadn’t been wearing one. Be sure your warm hat or balaclava fits underneath it. You have to get your gear to the route somehow. For ice “cragging” days, I choose something in the 35 to 40 liter size. A small “summit” or “leader’s” pack like the Black Diamond Bullet or the Cilogear 20L are excellent for longer routes where carrying a parka, food, and water are critical for success. Find a model that doesn’t affect your swing and that has a streamlined profile. In addition to everything mentioned above, I always have these other items squirreled away in my pack for every foray out on the ice. Harness. By using a model with adjustable leg loops, you can put it on after your crampons. Mine always has my trusty ATC-Guide belay device attached with its dedicated locking carabiner. Abalakov Tool. Otherwise known as a v-thread tool, these are indispensable for building rappel anchors in ice. A pocketknife for cutting cord is nice to have also. Headlamp. The days are short during the winter, so don’t forget your headlamp! I prefer a high output LED model. A belay jacket. Either down or synthetic is fine. This jacket goes on over all my layers upon reaching the belay and comes off just before I start climbing. Be sure that the hood fits over your helmet. Superlight rain shell. I only put mine on when I’m starting up pitches that are dripping wet. Buff or balaclava. In addition to your ‘beanie’ hat, a thin insulating layer for your head is often the ticket for staying warm at belays and while climbing. Small file. Keeping your tools and crampons sharp greatly increases their effectiveness and ease of placement. Spare gloves. In addition to my climbing gloves, I always throw a spare pair in the bottom of the pack for when my main pair gets soaked. Nourishment. Foods high in fat content help keep you warm. Combine these with lots of water in a thermos (or bring a Jetboil to heat up water at belays) to help keep yourself toasty throughout the day. Think of it as gas for the tank. First Aid Kit. Bring enough supplies to bandage small lacerations (ice is sharp! ), a splint, and some heat packs (to ward off frostbite on extremely cold days). Stick clips, just like you take sport climbing, are a very good idea for bolted mixed climbs. Preventing a ground fall is something your ankles will appreciate! Bringing a spare ice tool pick (and associated changing tools) along on alpine or multipitch ice climbs will allow you to replace a pick and keep on swinging that day. Alpine Climbing: Techniques to Take You Higher by Kathy Cosley and Mark Houston (Mountaineers Books, 2004). A version of this article was originally posted in the November 2007 issue of the American Alpine Institute newsletter. I dig the pics maybe since I am in one and my gear is in another but great post bud! Nice post. Very thorough. I already have most of my gear set up, except for maybe some screamers…and my rope is getting old. Hmmm. Hey Kurt, I really like your (new?) website. Very nice summary Kurt! I’m thinking that I might have too many 16’s and should get a few more 13s. I don’t have any stubbies either. Hmmm. Maybe some rack modification is in order.